. Travelling with Matsuo Basho . As a traveller, mostly walking, he depended on his stick quite a lot. 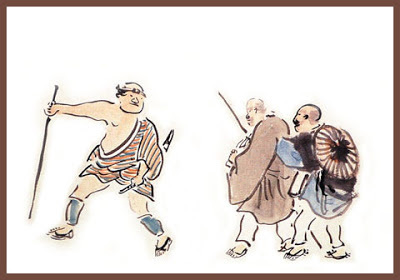 A strong stick in the hand of a samurai was also a weapon against wild animals. The sticks were made of various material, bamboo was a favorite. But light kinds of strong wood were also used. it was a custom with certain people to give a new walking staff to a man above the age of 50. 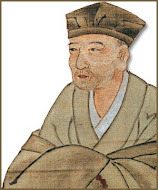 Ranran (1647 - 93) was one of Basho's oldest students in Edo . . . He died suddenly on September 26. Basho had depended on him, more than upon any other disciple, as his supporting "stick". "A mulberry bow" is part of an old Chinese phrase wishing future success for a boy. It has its origin in an ancient Chinese ritual, in which the father of a newborn boy would shoot an arrow with a mulberry bow as a token of his good wishes. Written in 1693, on the 27th of the 8th lunar month. On the death of Ranran 嵐蘭. Ranran lived in Asakusa, Edo. The mulberry stick has a hole in the middle and now, when broken, is as empty as the heart of Master Basho.
. tsuki mo naki yoi kara uma o tsurete kite .
. - Morikawa Kyoroku / Kyoriku 森川許六 - . Bashô’s admiration for the Seven Worthies of the Bamboo Grove and Tao Qian is clearly evident in his writings. One essay dedicated to his deceased disciple, Matsukura Ranran (1647–1693), for example, mentions that the Master had named Ranran’s young son after Wang Rong, one of the Seven Worthies. 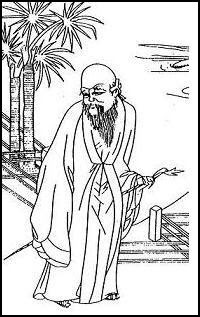 Wang Rong is one of the less famous of the Seven Worthies; Bashô’s choice therefore demonstrates his familiarity with the tradition as a whole. 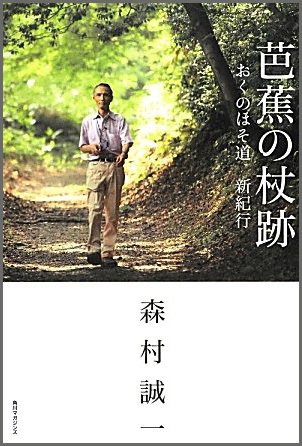 Though a very brief statement, the connection he draws between the Daoist spirit and the dedication to poetry here demonstrates a deep understanding of the Wei-Jin fengliu (風流) tradition.
. ie wa mina tsue ni shiragami no hakamairi . and one more about his own "white hair"
. shiraga nuku makura no shita ya kirigirisu . The slope Tsuetsukizaka 杖突坂 "Walking-stick Hill"
"I rented a horse at the village of Hinaga ... so I could ride up Walking-stick Hill. But my pack-saddle overturned and I was thrown from the horse. This hokku has no season word. The cut marker KANA is at the end of line 3. 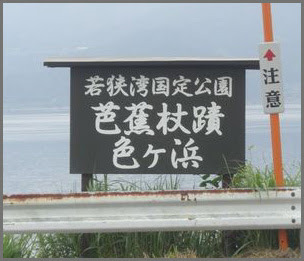 It is difficult to translate, keeping the meaning of the place name understandable without a long footnote. The slope Tsuetsukizaka, "slope to climb with a walking stick"
is in Mie prefecture, Yokkaichi, between the villages Uneme and Ishiyakushi, on the way to the great shrine at Ise　伊勢神宮. 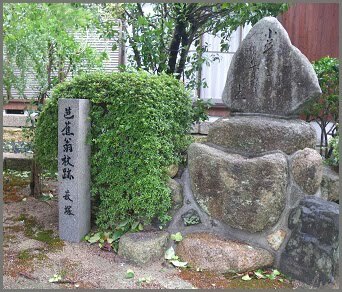 After the legendary hero Yamato Takeru no Kami 日本武尊 had fougt with the wild deities of Mount Ibukisan , he was so tired that he had to use a stick to walk this slope.
. Yamato Takeru 日本武尊, first Deity of Renku .
. Mount Ibuki 伊吹山 Ibuki-yama . Before the onset of winter in 1688, Basho had promised to meet the Buddhist layman Doo-En 道円居士 Do-En of Daitsu-An Hermitage 大通庵 (Daitsuu-an) . "like the frost of an early winter night." The staff must have been extremely long and remarkable, since Basho mentions its form in line 1 and its length in the last line. 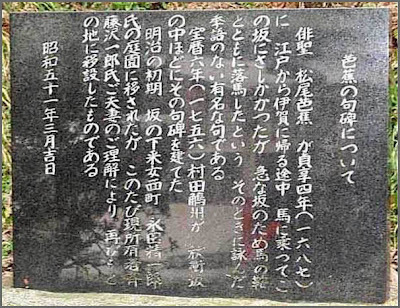 Written in Kajikawa, Gifu at temple Myooshooji 妙照寺 Myosho-Ji. At the home of Kihaku 己百, where Basho stayed for a short while. This is a greeting hokku for his host. He must have felt very comfortable there. 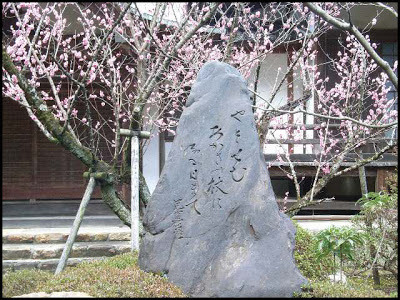 Kihaku later visited Basho in Kyoto and in Mino. 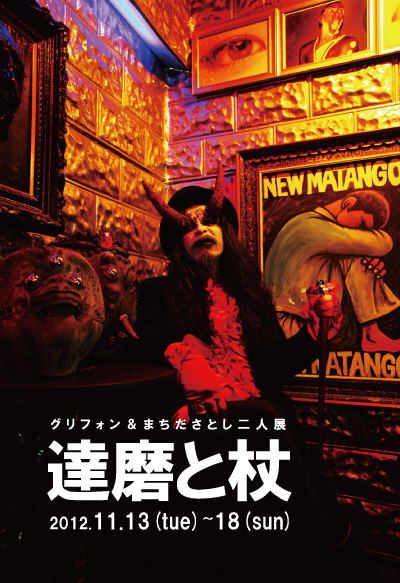 Two of his hokku are known. Into a walking stick is made. It is used in Asia to make canes, and refers to the Gods of Long Life. Canes of the thorny shrub. Sometimes seen as a phallic symbol.
. WKD : Du Fu 杜甫 (712–770) . who might he be ?
. akaza 藜 (あかざ) pigweed . 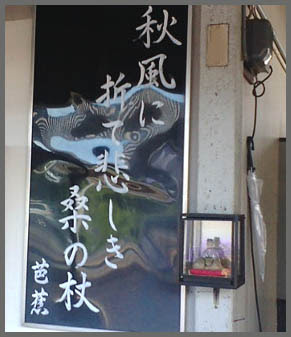 walking-staff in hand, I set out.
. Station 8 - Unganji 雲岸寺 . The chestnut is a holy tree, for the Chinese ideograph for chestnut is Tree placed directly below West, the direction of the holy land. 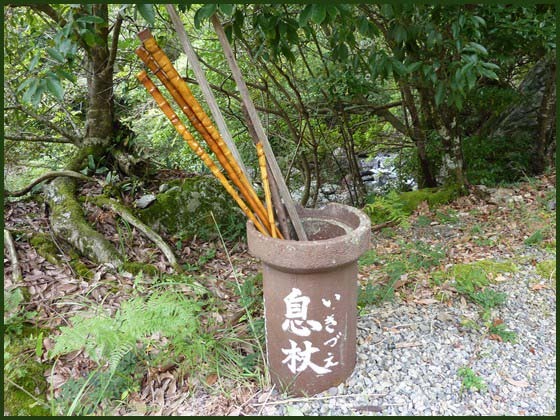 The Priest Gyoki is said to have used it for his walking stick and the chief support of his house.
. Station 11 - Sukagawa 須賀川 . According to the gate-keeper there was a huge body of mountains obstructing my way to the province of Dewa, and the road was terribly uncertain. So I decided to hire a guide. The gate-keeper was kind enough to find me a young man of tremendous physique, who walked in front of me with a curved sword strapped to his waist and a stick of oak gripped firmly in his hand. I myself followed him, afraid of what might happen on the way.
. Station 24 - Dewagoe　出羽越え . 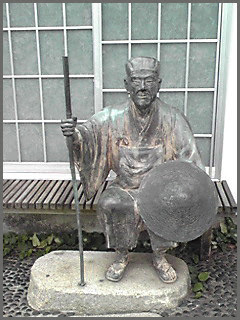 Basho left his walking stick at tempel 本隆寺 near Irogahama, Tsuruga.
. ko hagi chire Masuho no ko-gai ko sakazuki . How did the Tohoku region change after the great earthquake of March 2011? What is left from the region which Basho has seen? Morimura on a quest in Tohoku. kongootsue, kongoo tsue　金剛杖　"diamond staff"
. 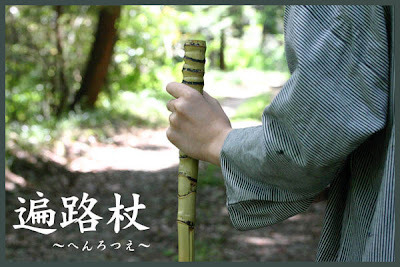 WKD : Henro 遍路 Shikoku Pilgrimage .
. WKD : Usaka no tsue 鵜坂の杖 Holy Sakaki stick of Usaka . and a festival hitting the unfaithful ladies . . .
. WKD : kayuzue 粥杖 "rice gruel stick" . in the withered field . . . 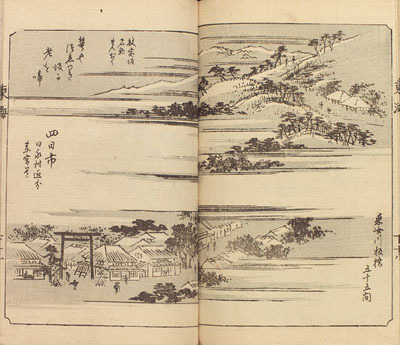 Written in 1778, Buson age 63.
ikizue , lit. "breathing stick", is the walking stick of porters of palanquins or luggage. Maybe the lower end of the stick was enforced with iron, which made sparks when placed on a stone. This poem shows the love for details observed by Buson.
. kasezue 鹿杖 "walking stick of deer horn" - shika no tsue 鹿の杖 .
. Traveling with Matsuo Basho .